Jim Clemens Collection No.8. 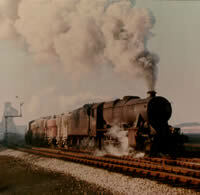 The Great Central London Extension was the last main line in England and closed as a through route from Aylesbury to Nottingham in 1966. Jim Clemens visited the line many times in the early 1960s and this video has comprehensive coverage of the route. The video takes the form of a complete return journey from Marylebone to Nottingham Victoria through most locations along the way. Included is a brief look at the line north of Nottingham through CHESTERFIELD to the WOODHEAD route. The connections to the GC at BANBURY and AYLESBURY to PRINCES RISBOROUGH are also included. Latterly the passenger trains were in the hands of Black 5’s but over the years covered other motive power was to be seen, LNER V2. 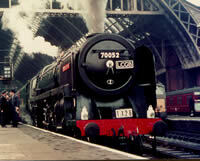 B1 and L1 classes, 9F’s on windcutters and the occasional passenger train. 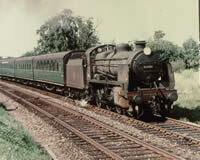 Britannias are also seen and GWR Halls, especially at Banbury. 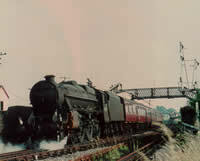 A video film for all lovers of the steam locomotive, it covers the period from 1958 to 1968, the last ten years of steam traction on British Railways. This film is the work of one man, Douglas Cartmel, a true steam and railway enthusiast, who captured the locomotives of the period as he moved around England in search of an ever decreasing form of traction. In black and white and colour, we can re-live the sights of Southern Lord Nelsons, King Arthurs, Schools, 700 Class Black Motors, H, E4 and Terrier tanks. 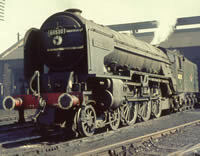 On the Western there are Kings, Castles, Halls, Counties and 28xx Classes alongside tank engines. Living in the Stockport area, Midland Region Duchess, Scot, Jubilee, Black 5′s, Crabs and 2-8-0′s all caught Doug’s attention. Southern locations from Eastbourne, Tonbridge, Woking, Guildford and Salisbury feature, with Paddington, Didcot and Weymouth on the Western. Wrexham, Saltney, Stockport, Rowsley and Blackburn and many other sites cover the London Midland up to the end of steam in 1968. 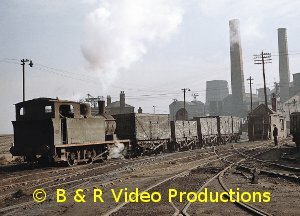 The photographic opportunities of locomotive sheds at Edgeley, NewtonHeath and Heaton Mersey are very well filmed, as are four industrial locations in the North West. 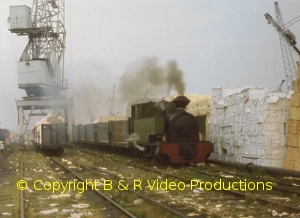 There are 50 Classes of locomotives and 100 different engines on this film, seen through the camera of an enthusiast with an eye for detail and the unusual, an excellent record of ten years of steam, from someone who appreciated the steam age in Britain.